an italian summer house :: from the archive. | owl's house london. an italian summer house :: from the archive. There is good reason this 17th-century oil mill in southern Italy looks more like a furniture showroom than an inhabited summer house. The dwelling is filled to the brim with the designs of the owners, the architects (and husband and wife team) behind Palomba Serafini Associati, who have together designed bathrooms, kitchens, furniture and lighting for some of the biggest names in Italian design: Boffi, Cappellini, Foscarini and Zanotta. 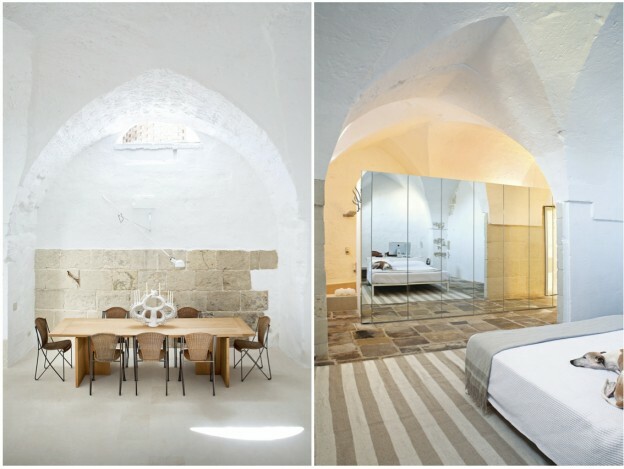 Retaining the rawness of the existing structure, they have made few interventions, retaining ancient stone floors, walls and arches. A lack of windows in the old mill has been overcome with the use of skylights carved out of the stone, as well as a patio at the rear, allowing the daylight to flood in. 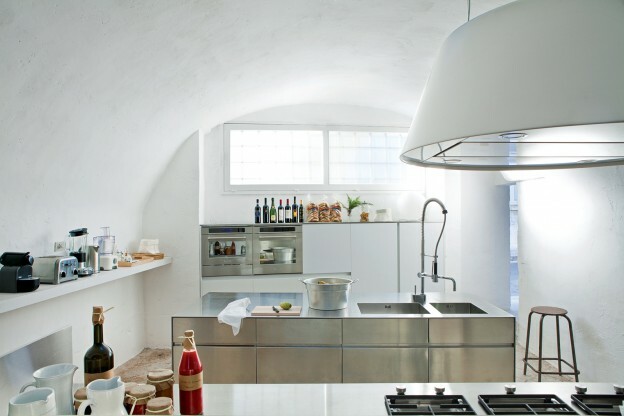 In the kitchen they have adapted to the existing space, adding only a sleek, minimal but multi-functional stainless steel island, originally designed for the Italian cabinetry company Elmar. A stainless steel screen separates the work and sleeping areas. As well as their manufactured products, the home contains bespoke pieces, all commissioned from local craftspeople. One piece that really stands out is the Lama chaise longue, originally designed for Zanotta in steel and leather (see it, here); here they have upholstered it in straw and red metal. It is a beautiful and fluid stand-alone piece. Via Dwell. Images by Francesco Bolis. 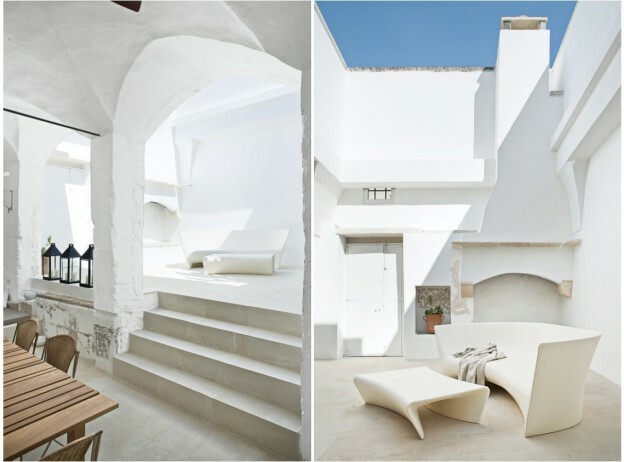 What do you think of Italian summer house – showroom or home? This entry was posted in wonderful spaces. 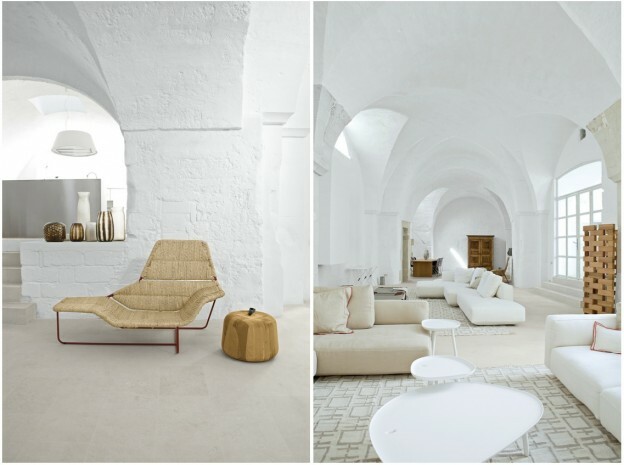 and tagged architecture, Boffi, Cappellini, design, Foscarini, Lama chaise longue, Palomba Serafini Associati, Zanotta on June 3, 2013 by owls house london..
What a stunning space. They have truly shown respect to the history of this 17th century building by styling the interiors using such a minimalistic approach. I choose home, this space is perfect, but in a livable way. Thanks for great design inspiration. hi lauren, such a pleasure! Wow! What a great share, didn’t know about this house. It’s amazing how “old” architecture can be adapted to the current times. I would love to see more posts like this one, it was interesting and inspiring! Classic example of an earthy , Mediterranean design. Pingback: elemental house. | owl's house london. Pingback: house in noto. | owl's house london.